The friars assigned in faraway towns improvised a variety of waterworks, often using bamboos or hollowed logs. The system that brought ice-cold water from Mount Banahaw to Majayjay town of Laguna is still one of that town’s prized relics. However in old Manila, the rivers continued to be the chief source of water. For drinking, river water was strained through cloth in a tapayan and then clarified with tawas (alum). Rizal noted that in his day the rivers and esteros in Binondo served as bath, sewer, laundry, fishery, transport and even drinking water, if thus found convenient by the Chinese aguador. This explains that most of the great epedemics of the last century were water-borne. Manila didn’t get running water until 1878, when the municipal waterworks was established by Governor Domingo Moriones, with money from a fund that by then had become legendary as the Carriedo Legacy. A “public-spirited citizen,” Don Francisco Carriedo y Peredo was a Basque from Santander who during his life conferred immense benefits on the Philippines, having migrated in the Philippines early in the 18th century. One of his “obras pias” (pious works), was a legacy he left in his will for the building of a Manila water system. Though Señor Carriedo did not live long enough to see his legacy since he died in 1743, Manila was to be without running water for more than a century longer. Thanks to Governor Moriones who acted on providing Manila with running water that the Carriedo Legacy was finally fulfilled. A fountain was originally erected at the intersection of Legarda, Nagtahan and Magsaysay Streets (now beneath several layers of flyovers) in Sampaloc to mark the inauguration of the Manila Waterworks that was funded out of the Carriedo Legacy. The fountain was then brought to Balara in Quezon City, infront of the Manila Waterworks and Sewerage Authority Building when the water agency’s main office was moved from Arroceros to Balara in late ’70s. During the first term of Alfredo Lim as Manila mayor, he negotiated with MWSS administrator then Mr. Luis V. Z. Sison for the original Carriedo Fountain to be brought back to Manila. 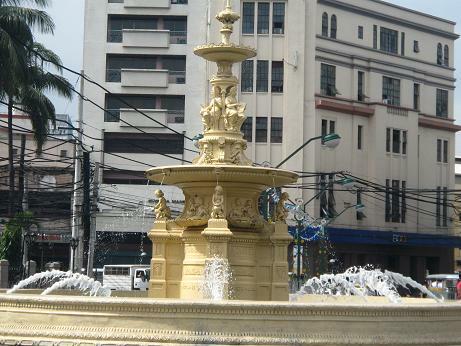 The MWSS administrator only agreed on the condition that The City of Manila had to allow the MWSS to have the fountain replicated before it was returned. MWSS commissioned national artist Napoleon Abueva to do a replica of the original Carriedo Fountain that would stand on the spot where the original used to stand in Balara. It took a year for Abueva to come up with a beautiful rendition that won’t be suspected as a replica using plaster as chief material. 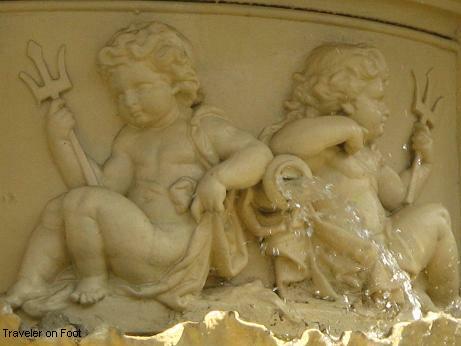 The original Carriedo fountain now stands at Plaza Santa Cruz. wow.. I never knew there is a replica of that wonderful Carriedo fountain. I just found out about your web lately and I’m greatful I’ve found it, I grew up in Manila but not aware of all the history or because I lived there that I take for granted and ignore my surrounding. Any way thank you very much, Next time I visited Manila I will use your web to see the real Manila. Thanks for all the information contained in here. It’s really helpful for my report in Environmental Engineering. Just a remark, the sentence “Don Francisco Carriedo y Peredo was a Basque from Santander” is not correct, Santander is the capital city of Cantabria-Spain and it is not (and it never was) part of the Basque country. I always drink from the wall mounted drinking water fountain at my workplace. Recently, I have been feeling sick. Perhaps the water fountain made me sick? For the past two days, there has been a water bubble sticking out of the water hole of the fountain. Can you get sick or injured from drinking water from a wall mounted drinking water fountain? Nice to see how your blog has evolved into not just a personal account of your travels as a family, but also as a chronicle of how rich our culture and heritage is. I particularly take note of your efforts to feature minute details of common places like Sta Cruz and Quiapo within the rapidly changing face of Metro Manila. Finally, Joaquin has grown to be a beautiful child thanks to the exceptional genetic strains from Anne. And lest I be banned from this blog site, let me say that Joaquin is fortunate to have a sensitive and multi-talented father in Glen Martinez whom I hope he takes after as he matures. See you around soon, I hope. Hi Carol. We love going places and trying to make the irrelevant relevant about being Filipino. Hope to see you again soon. well I can only say that our country has a very unique and well advanced civilization back in the apanish era and nowadays people of the republic does not have any interest on history. 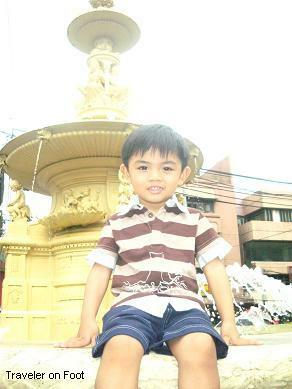 I pity the carriedo fountain bec. its now “tambayan” of the street peddlers and beggars of the city of manila and nobody knows its unique and wonderful past. I’ve always heard about the fountain from my family but I have never gotten a chance to see it personally. I think he donated about 20,000 pesos which was back then a good amount of money.